Two years ago Beat:Cancer stepped up their live game, hosting the first edition of B:C Fest. An 8 band 1 day festival hosted by the globally renowned Slimelight this gave us an oppurtunity to bring in more international acts, from further afield than ever before – headed up by some dude who flew 4000 miles to sing songs about Nintendo… AKA The Gothsicles. Backed up by B:C faves ESA and Memmaker and some of the best of British talent the B:C Fest V1 sold out and proved a roaring success. Two years later we’re just about rested up enough to run another on; Saturday 9th November, once again at Slimelight (London, again bringing top class, well loved bands in from round the world. 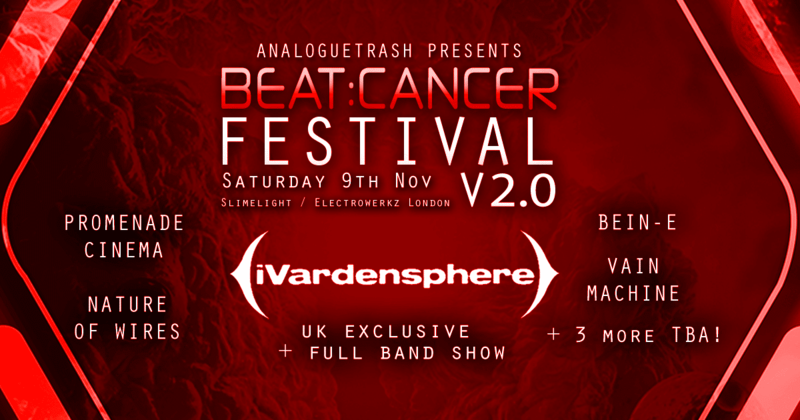 This year our headliner is the mighty tribal infused industrial machine iVardensphere; we’ve managed to score the only full 6 piece iVardensphere performance in Europe: an unmissable experience if there ever was one! Flying in to join them in London are bass driven Vain Machine from Los Angeles, Mexican duo Clekktor and Greek outfit CygnosiC. Not to be forgotten are 4 excellent UK acts spanning the brilliant diversity that the British scene affords: Promenade Cinema, Nature Of Wires, BeinE and Drakenwerks. This year’s early bird tickets have already gone, and we’re certain to sell out before the event – but fear not, advance tickets are only £20 and include entry to the legendary Slimelight for an afterparty with some of the best alternative DJs in the world… blasting through the night till dawn! Join us this November as we raise the roof and show cancer who’s boss – tickets are available online at tickets.beatcancer.info, book now to avoid disappointment!